In a moist, chilly remote underground cave in Kaltbach near Lucerne Switzerland, a cheese is maturing into what we know as Cave-aged Gruyere. 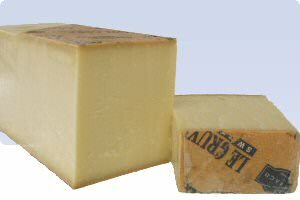 It is matured for about 1 year in the sandstone caves and this older gruyere, made from unpasteurized milk, is a step up in flavor compared to the traditional gruyere. This gourmet cheese matures reflecting a densely thick texture cheese. This Swiss gourmet cheese has a dark rustic, somewhat oily rind that covers a firm, dense textured cheese with salt crystals here and there. It is slightly aromatic with a robust, assertive flavor. It is soft yet firm; the Swiss cheese intense and dignified. Wonderful served with your favorite red wine, some rustic bread and figs or dates. This is also a great melting cheese, and one that lends itself well to gratins, fondues and soups as it adds more flavor than the traditional shorter aged gruyere. Enjoy this just about any libation; this cheese will rise to the occasion.